Globalization is an inevitable trend as improvements in travel and logistics enable us to move people and goods between countries quickly and securely. Meanwhile, advancements in technology now let us communicate effectively and share data with international business partners in real time. Savvy business leaders know that international partnerships hold many unique advantages that can drive increased sales and business growth. 1. You will expand your reach. Moving into new markets can help your company grow and will afford you the opportunity of becoming a first mover and exploiting the advantages that come with this. You will have the first chance to introduce your brand to new markets before your competition. 2. You will access new technologies. When you form a partnership, you also share resources with those partners. As such, you’ll find yourself exposed to and benefitting from new technologies you haven’t used before. This exposure gives you a chance to evaluate new software platforms and/or machinery without investing with your own resources. 3. You will improve your talent pipeline. Your partner’s employees will have a different way of looking at your operation, and this outside perspective can give you valuable insight. In addition, your own workforce will benefit as well. From increased productivity, to advanced language skills, to a diversity of educational backgrounds, new talent and diverse viewpoints provide many opportunities to help your business grow in an ever-changing global landscape. 4. You can diversify your revenue stream. Ever hear that old adage about not putting all of your eggs in one basket? Expanding through international partnerships allows for diversification of products and services as you and your partner both gain access to new markets. As most domestic and international business professionals know, markets ebb and flow. By operating simultaneously in multiple global markets, you can use positive trends in one to offset negative trends in another, and keep your company in the green during hard times. 5. Your capacity to innovate will improve. International partnerships give you access to new methods of doing things. While you are bringing your expertise to new markets, you can also learn new strategies and best practices which may help you to maximize your potential—not just in the new market, but in all markets. 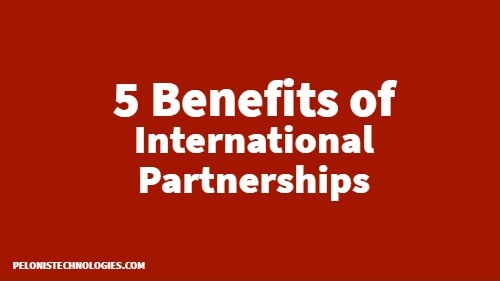 International partnerships are definitely something you should be considering if you’re looking to grow your business. At Pelonis Technologies, we can give you access to quality specialized products and services that may not be readily available in some geographic areas. Pelonis Technologies has more than 25 years of innovative manufacturing and production experience so you can trust that we will bring quality, speed, and value to any new international business partnership. Our air movement technologies, heating and cooling solutions, induction motors, and custom solutions are used around the world every day to help our international partners meet the needs of myriad operations and industries. To find out how an international partnership with Pelonis Technologies can benefit your business, contact us today.